In 2010, when a small group of local writers and other supporters of literary arts got together to talk about putting on a Yamhill County creative writing festival, no one knew if there would actually be interest in such an event. The Arts Alliance of Yamhill County agreed to sponsor the festival, and the Yamhill County Cultural Coalition gave a grant to help fund the project. A variety of other local groups and individuals stepped up to make contributions ranging from cash, cookies and donuts to wine and table bouquets. McMinnville’s Third Street Books offered to be our festival bookstore, as they have been every year since. The McMinnville Community Center agreed to provide space. Soon we were off and running. Registration was far beyond what we expected with more than 150 people attending that first year. Now in its fifth year, the festival has definitely found a place in the creative life of Yamhill County. One aim of the festival is to build a stronger literary community in our area by encouraging and spotlighting local writers while also making connections with the writing and publishing community beyond, but you don’t have to be a writer to attend. Anyone interested in writing and writers will find something to enjoy. Past speakers have included visiting authors Ursula K. LeGuin, Molly Gloss, Jean Auel and Willy Vlautin, as well as authors from our area such as Lex Runciman, Phoebe Newman, Linfield graduate Molly Johnson and book artist Marilyn Worrix. With anywhere from 10-15 speakers each year, many outstanding authors have shared the secrets of their craft, offered encouragement, and given readings from their works. In 2013, Chemeketa Community College stepped up to provide a larger venue at its new Yamhill Valley campus in McMinnville, Oregon. 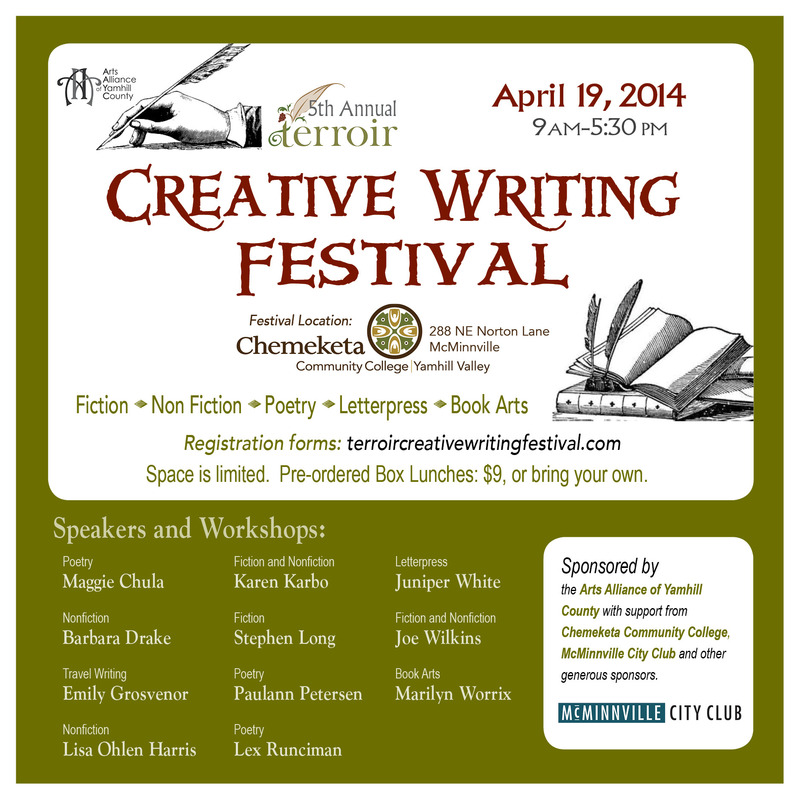 This year’s Terroir Creative Writing Festival will again be held at the Yamhill Valley branch of Chemeketa Community College, on April 19, 2014, and again will offer a mix of local and non-local writers speaking and giving workshops, and reading from their own writing. New topics this year include a hands-on workshop on making letterpress broadsides by Dwell Press artist Juniper White and a session on writing for the travel market by Emily Grosvenor. The festival will also feature Marilyn Worrix’s popular handmade book workshop. Presenting authors include: Oregon Poet Laureate Paulann Petersen; widely published novelist and nonfiction author Karen Karbo; prize winning essayist and poet Joe Wilkins; travel writer Emily Grosvenor; book artist Marilyn Worrix; poet Lex Runciman; poet, memoirist and textbook author Barbara Drake; letterpress artist Juniper White; novelist Stephen Long; nonfiction author Lisa Ohlen Harris; and poet and president of the Tanka Society of America Maggie Chula. Books by featured authors will be available at the festival bookstore, and authors will be available at a signing table to sign their books and chat informally with festival attendees. Although all book sales will be conducted through Third Street Books, any author registered for the festival is invited to bring a representative copy of his or her work to display on a table near the registration desk. Adults: Pre-registration $45; On-site registration $55. Students and Seniors 65+: Pre-registration $35; on-site registration $45. Box lunches are available with pre-registration for $9.00. Registration forms can be downloaded here or from the Arts Alliance website http://www.artsallianceyamhillco.org/. Please submit your form and payment by mail to AAYC, PO Box 898, McMinnville, Oregon, 97128. Make checks payable to AAYC. Unfortunately, we cannot accept credit cards. Please note: We would like to offer this experience to as many people as possible, but space is limited, so pre-registration is strongly recommended. Also, if teachers or others know of someone who would be seriously interested and would benefit from attending but cannot afford registration, please contact us about possibilities for scholarships. The Terroir Creative Writing Festival is sponsored by the Arts Alliance of Yamhill County and Chemeketa Community College. A complete list of donors and sponsors will be announced at a date closer to the festival and will appear in the festival program.